Following an initial unveiling back at IFA, Harman Kardon has today announced that its GLA-55 high-end speaker system is now available to purchase in the UK. 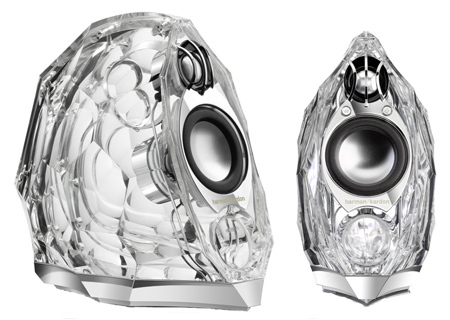 The clear-glass speakers, pictured below, are claim to offer "the perfect mix of cutting-edge style and impeccable sonic performance". We can't comment on the latter, but they're certainly stunning to look at. Atlas AL and CMMD Transducers - The CMMD drivers provide accurate high frequencies, but are capable of low-frequency extension to four octaves; the Atlas AL drivers are capable of nearly 2,5 cm peak-to-peak travel for tight, accurate bass reproduction. Their pairing provides a full, rich frequency response, from the lowest bass to highest highs. Slipstream Port Design - The GLA-55 port minimises boundary layer separation, providing high-output bass with low distortion. COE (Computer-Optimised Equalisation) - The system equalisation is computer-optimised to provide a rich, complete soundstage over a wide range of listening positions. OCT (Optimised Compression Topology) - The GLA-55 system utilises a proprietary compression technology to ensure clean, accurate sound at high output levels. The Harman Kardon GLA-55 system is compatible with desktop computers (all platforms), laptops and MP3 and portable media players. In clear with chrome accents. Want to make somebody very, very happy this Christmas? The GLA-55 system is expected to arrive on the UK Apple store later today priced at just £749.99. At 749 I think I'd go for a decent amp, speakers and soundcard! Is that truely £749.99? and not £74.99? Who in their right mind would pay that much for ipod speakers. Plus HK aren't really reknowned for their speakers, they are ok but I would prefer to spend my money on something from someone like Mission and get an amp etc. Oh and IMO they look hideous. If I was paying that much I would want lashings of real wood! For that price one can have a very nice 5.1 setup and enjoy the sound even better. OK, if they are glass, won't all the dust that naturally gets in the bass port make it look pretty grubby pretty quickly? EDIT: Forgot to comment on the price, £749.99… Wow I can get an i7 + Mobo + 5870 setup just about for that price.